A hole is dug into the ground. Plastic tarp is attached to wooden poles and serves as privacy walls. That's how most of the toilets in Mackenzie Community look – if you can find toilets at all. So far, the toilets at Mackenzie Community School didn't look much different, except for the fact that the walls were actually made out of concrete. But that didn't prevent a rapid rise in the risk and spread of Cholera during rainy season, not the least due to overflowing toilets. As a result, the Health Ministry in Ndola had threatened to close Mackenzie Community School. By providing flushed toilets with a proper disposal system this risk was now addressed and removed. All in all the project took about five weeks complete. In a first step, we emphasized the need for a pre-approval by the Ministry of Health of the plans presented to us by the community. From previous project work we knew that it can often be challenging to successfully establish contact with the right people at the ministry in order to get an approval within a reasonable time frame. Thankfully, due to these previous experiences as well as our persistence we succeeded in doing so, and within a matter of only a couple of days a written approval was obtained. On the same day we received the approval we already headed to town to purchase the first round of materials. After all, we didn't want to lose time but commence with the necessary construction work the next day already. 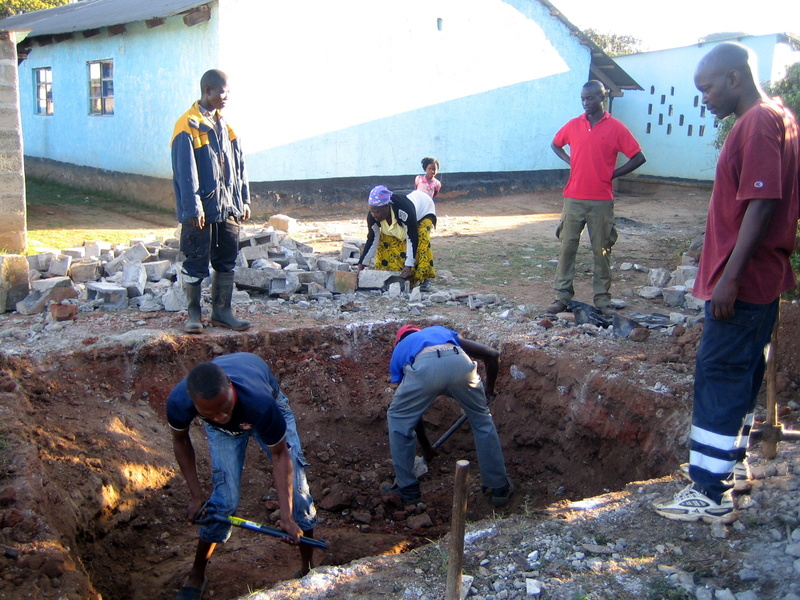 All necessary construction work, starting with the sewage tanks, to building the restroom stalls, putting on roofing, and completing plumbing and water connections, was done by a local member of the community in Mackenzie who was assisted by four local youth. At the construction site, work progressed six out of seven days a week and on a daily basis we had curious members of Mackenzie Community stop by to learn more about the work that was being undertaken. For example, one of them was an older woman who limped towards us to give us a huge hug to express her thankfulness and appreciation. In another instance, a young man dropped whatever he was doing and joined us for half day until sunset to help. And of course there were the many students of Mackenzie Community School who, during each break, came running towards us to inspect with great excitement the progress of 'their' toilets. This resulted in the work, which was often back-breaking and accomplished without heavy machinery, being done in an atmosphere of great excitement and joy. One of the members of Mackenzie Community, whose son is a participant in the iChange Scholarship Program, took it upon herself to prepare a meal for the crew every day in order to avoid losing too much time having to fetch food during lunch break. In the end, it wasn't just the work crew but a whole 'team' of the community that contributed to the swift and successful completion of the work. Once completed, the toilets were duly inspected by the Ministry of Health and – upon successful approval – officially dedicated to the Mackenzie Community School. For the first time since its founding the school now has modern and hygienic flushed toilets. As always a heartfelt and sincere thank you – also from the Ministry of Health – to all donors, contributors and workers in this successful project.